The movie reached #1 at the Japanese box office in 2006, but received mixed reviews. It was nominated for Animation of the Year, but ultimately won the tongue-in-cheek Bunshun Raspberry Award after failing to meet Ghibli fans' expectations. 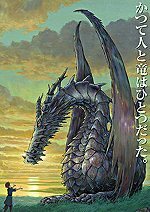 The plot is ostensibly based on the Earthsea novels, including sections of A Wizard of Earthsea, The Farthest Shore and Tehanu. Author Ursula K. Le Guin called Tales "a good movie" but "not my book", and was critical of its PG-13 violence. Earthsea's director was Gor? Miyazaki; his famous father was busy with Howl's Moving Castle. I for one am interested in how the film portrays the world of Earthsea. I always said it would be impossible to convey the feel of the books through film, but animé? It may well work.